14 Stand firm therefore, having girded your loins with truth, and having put on the breastplate of righteousness, 15 and having shod your feet with the preparation of the gospel of peace; 16 in addition to all, taking up the shield of faith with which you will be able to extinguish all the flaming arrows of the evil one. 17 And take the helmet of salvation, and the sword of the Spirit, which is the word of God. The Good News is really good news! Each of the pieces of armor have (obviously) an extremely unique and significant role in the big picture of how we are to live out transformed lives. It is an instruction manual if you will. Each item represented has it’s own purpose, that if we will make the life concepts presented in each of these pieces a part of our core foundation in life we will be free and empowered to live as the men and women God created us to be. 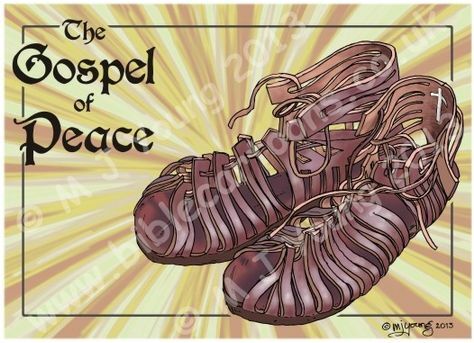 Jesus Christ himself modeled what it is to wear the sandals of the Gospel of Peace. Once His ministry began He never stayed at one place. He went into the world to share the message of salvation obtained through the healing and forgiveness found only through Him. And His calling to the Apostles (and us as Disciples) is to spread that message to others. In all of the translations I looked up, this verse mentions readiness and preparation. It is not enough to hear the Good News of Christ and then simply repeat it. This is a call to have the Word of God, the Joy of Salvation, the Peace of Eternal Relationship built up and strengthened within our own hearts first; we must prepare. The Good News must be a part of our very being, the core foundation of our existence. There can never been a true passion and purpose found in Jesus without first experiencing personally what the Gospel means to you as an individual. I was presented with a vision, a waking dream for lack of a better term. It was a movie scene that played out in my head one day. Standing at the sink doing dishes and looking out a window I could see my son and a neighbor boy playing ball in the front yard. It was a quiet street with well manicured lawns and tall shady trees. The sky was blue with some wispy clouds above, a truly beautiful and peaceful day. I could see the father of the other child across the street mowing his lawn but also very clearly was intentional about watching the children play as I was. It was comforting to know that in this community that other parents cared as I did, that we were all parents to all the kids in our neighborhood. It brought about a peaceful feeling, a trust, an assurance. Then the images slowed. A school bus comes around the corner, the ball begins bouncing toward the street, the neighbor across the street catches eyes with me and we both realize what is unfolding at a lightning bolts pace. He runs from the mower toward the boys as both boys start running after the ball into the street. It is a horrifying scene, not a second to spare. I stand frozen in the window watching the scene unfold as the man sprints full speed into the street as a blur of red ball, yellow bus and kids clothes all mesh together in one terrifying second when then all merge on the same place and time. And then it happens, the frame freezes on a picture of the neighbor, having to choose between two boys who will surely be crushed to their death, chooses my son over his! I gasp with horror as he barely reaches my son in time and he shoves him with all his might and him and my son narrowly escape certain death, but his son is hit, run over, crushed. I could hear the sounds, the screeching of the tires, the yell of the children, the groans of the father, I can see the images; I begin to weep. And then hardest part of it all; the wail of a father who knows that he has just lost his only son; the sobs, the pain, the unquenchable anguish. He made a choice to sacrifice his only son so that my son, my family, that I could live in peace and joy. How can I ever look at this man the same again. How will my heart not be wrenched to agonizing pain and overwhelming gratitude the next time and every time I see him, think of him. How much will our family offer up prayers of gratitude to this man for his seemingly insane choice of me and my family over his own. Tears are streaming down my face at this moment as I recount this waking dream for you. For years now I can recall this Passion of Christ; recall what was done for me personally through the Cross of Christ, recall the sacrifice and the pain and be filled with incredible amounts of gratitude, of almost shocking disbelief at the selfless act of God for me. Why would the God of all creation come to earth, live in the flesh, suffer a life of hardship, torment, pain, ridicule, rejection and death for me personally, for you personally, for a world of wretched sinners. Wouldn’t the obvious choice for an all powerful Creator be to uncreate and start again? We don’t deserve His blood, we didn’t earn it, we are not good people, we do not have love in our hearts. There is only one who is Holy and Righteous and Worthy, and He died for us, each and every one of us. The Father sent the Son who died and rose again and in that we are now given the Gospel of Peace and through the Holy Spirit are called to have this Gospel firmly planted in our hearts so that it changes us, calls us, compels us to take this message to others. We must first adorn the shoes ourselves, to make the Good News personal, to feel the sacrifice at the heart level, to know that the price was paid was way too high, but that price was paid by a benevolent God who loves us, died for us, and now walks with us. Do you know that God died for you personally? Is the contemplation of Jesus’ death, resurrection and ascension something you can tangibly point to in your life as having changed everything? Have you had your mind blown at experiencing the power of the Holy Spirit place thoughts, feelings, words, actions or desires upon your whole being that clearly didn’t come from just reading a book? Have you experienced the joy of witnessing the transformation of lives around you because they trusted Jesus and He changed them, gave them a softer heart, gave them the ability for the first times in their life to take ownership for their own wrongs instead of blame others, to find humility and grace instead of judgment and blame? Have you found your own heart softened to a stance of compassion for the broken, the lost, the hurting because no longer do you see yourself as above them, but realize we are all just broken beggars seeking Living Waters? Theology is the study of God’s Word, but the Gospel, the Good News of Christ is not an intellectual endeavor, it is a heart transplant of the highest order brought forth by having our head knowledge transformed into heart action. The Gospel of Peace changes lives. It must however change our own thoughts, belief, attitudes and behaviors first before we can live out the calling to be fearless influencers to a hurting and broken world. Father God, you reach into the heart so deeply with Your message of hope and healing. Your grace and mercy is unequaled and nearly incomprehensible. That You would sacrifice that most dearest to You for us, sinners, and love us as we are, in this state of humanness, weak, frail, fearful, self-righteous, prideful, selfish wretched selves. That You would love us so much that You would provide the only way to cross the uncrossable channel of sin through Your only Son. The price was too high Father, and yet the price was paid just the same. Let our lives not ever be arrogant enough to think we can pursue and achieve righteousness and salvation through our own works, but instead let our lives be the outpouring of gratitude and love, a mere reflection of the gifts You alone shower upon us. Thank You Lord Jesus, may You be the ruler of our lives, may we submit to Your gracious will which only has our best and Your glory at heart. In Your precious name Jesus I pray…. This entry was posted in Armor of God, bible study, conviction, encouragement, Jesus, love, Recovery, The Cross and tagged forgiveness, Gospel of Peace, Holy Spirit, love, passion of Christ, redemption, resurrection, sacrifice, the Good News. Bookmark the permalink.